Whether or not you've used First Performance, First Performance Plus will help you lead your band in the right direction! 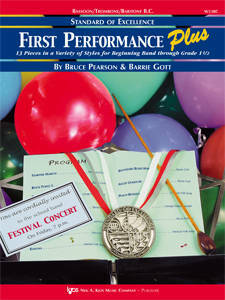 Included repertoire includes 13 Songs - Grades 0.5 to 1.5 - that represent a variety of musical styles such as rock, swing, marches, traditional folk songs, transcriptions, and original concert, contest, and festival music. Each piece was composed or arranged especially for first and second year band students to provide a repertoire of varied, fun, and exciting concert music.